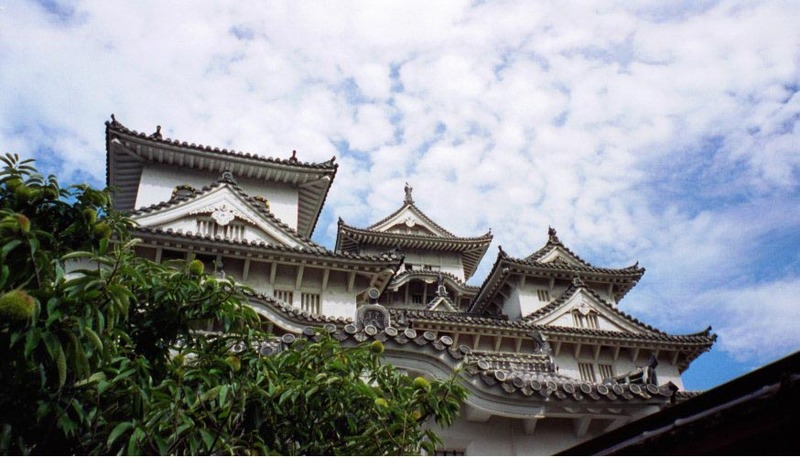 Although Himeji is a nice, livable, medium-sized town in the Kansai, that's not the reason to go there -- you're going because of the castle. 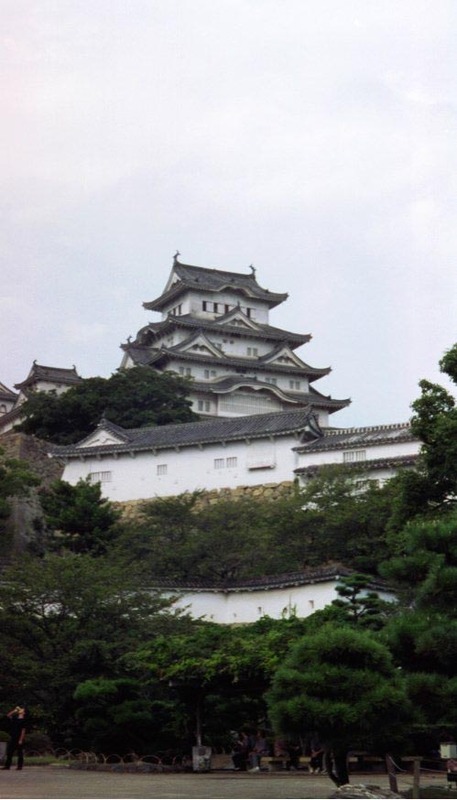 Himeji castle is probably the most famous castle site in Japan, and one of the few to survive WWII in its original state (most Japanese castles were destroyed either at the Meiji restoration or by American bombing during WWII). It is totally worth all the fame. The castle totally dominates the town, sitting on the largest hill in sight. Getting there is no problem; come out of Himeji-eki and head down the biggest street. 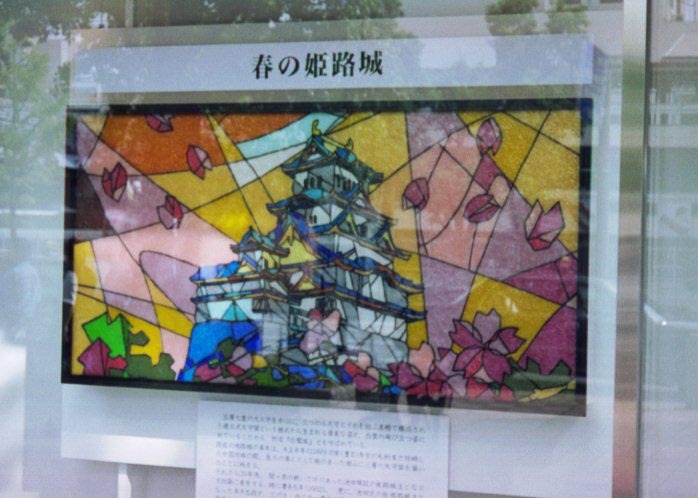 On the way, you'll be treated to lots of awesome stained glass in the shop windows along Otemae St. They don't want to let you forget about the castle! on the charge of missing the dish. was replaced with new stuff. 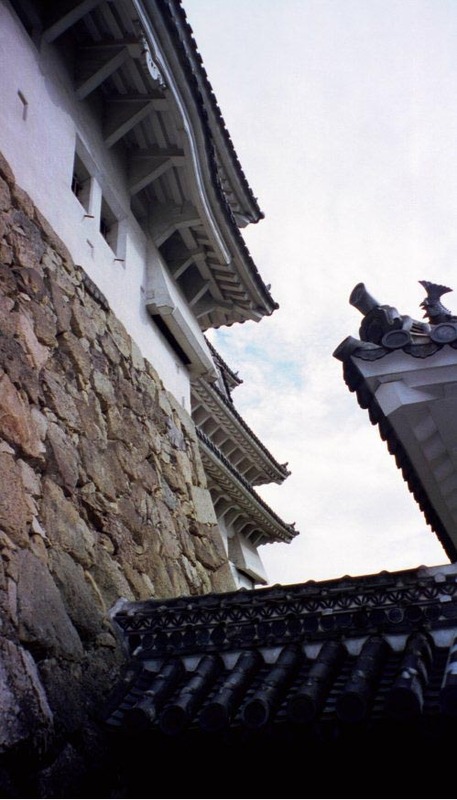 One of the neat things about Himeji castle is that it really was built with defense in mind (Okayama castle, for instance, was clearly built after the wars had mostly ended). 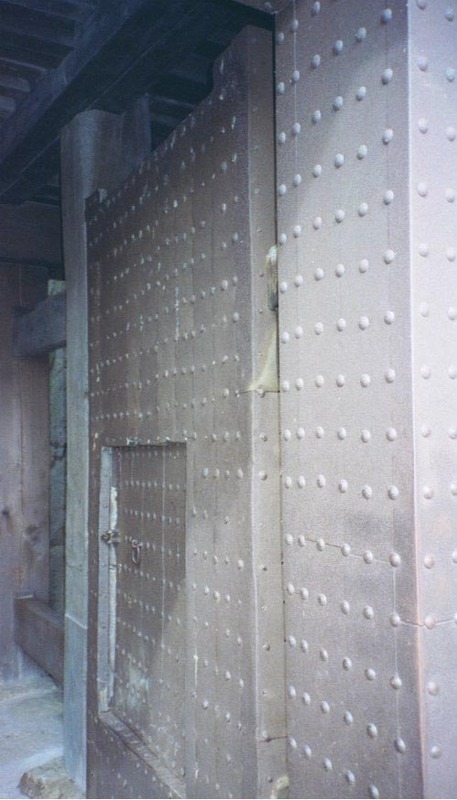 The photos at left show some conventional gun/arrow slits, above, and a cool triangular one below. The doors (right) were definitely built to keep out the unwelcome salesman! There are lots of stories connected to the castle. 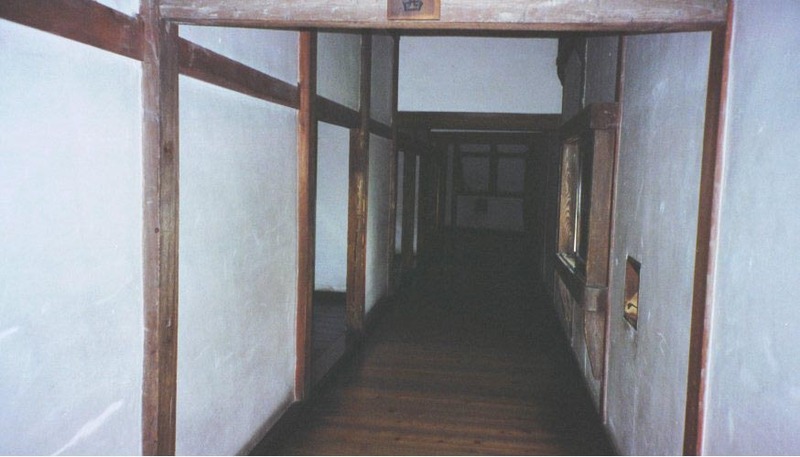 The building shown at left is called the Long Corridor, and ends at the chambers of "sen-hime" (Princess Sen). This child of politics was married at age 7 (yes, seven) to Toyotomi Hideyori, then widowed via post-losing-battle harikari at nineteen.She fell in love with Honda Tadatoki and came to live here in Himeji castle. But she lost a son and then her second husband by the age of 30, and lived out the rest of her life (until age 70) here in the castle. Another of the good stories concerns a well within the castle grounds. A maid named Okiku overheard a plot by a retainer to overthrow the lord. She informed the lord, who took steps to prevent the uprising. 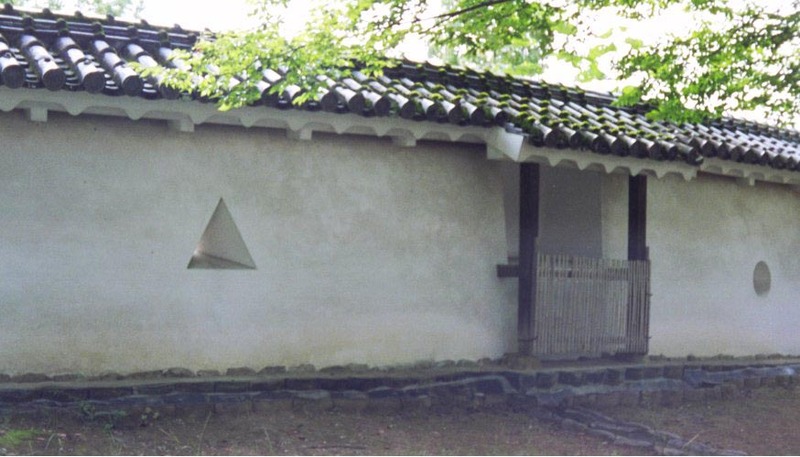 But the retainer found out that Okiku was the one who had ruined his plan. The retainer removed a valuable dish, then accused Okiku of stealing it. On that charge, she was killed by being thrown in the well. 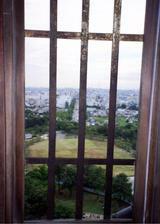 For many years, castle residents then heard the wronged woman's sobs coming up from the well. Mostly, though, you just appreciate Himeji castle for its beauty. The construction and the attention to details and to the angles formed by the views in every direction is amazing -- especially for a building with real military purpose. 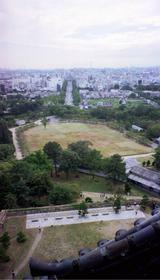 These are the views from the top of the main tower of the castle, looking back down the main drag of Himeji (otemae). 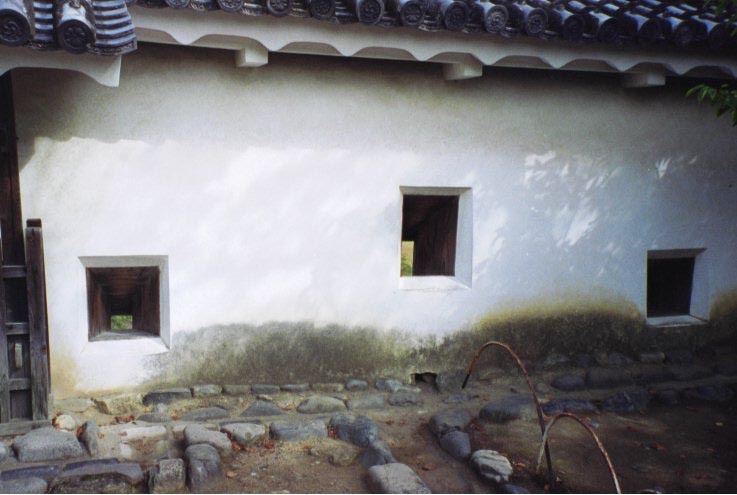 The photo on the right is sticking the camera through the window in the photo on the left. The main JR station is at the other end of the street. 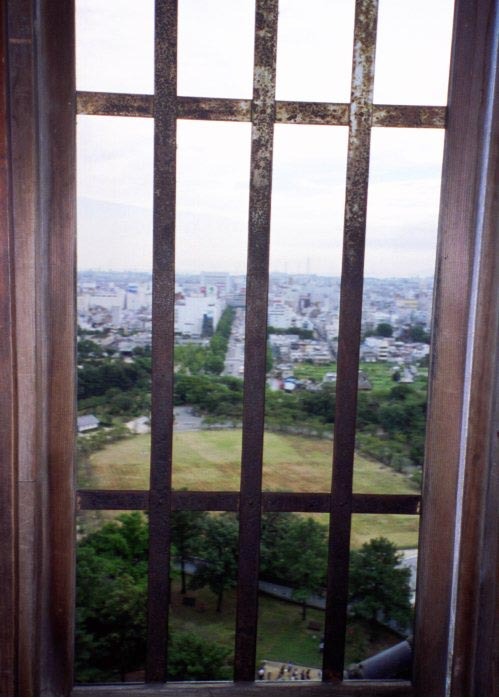 It's well worth poking around the castle hunting for unique views. Also, it's a good excuse for having a wide-format camera.